As most HVAC technicians know, hardly any job is ever routine. On a given service call you may be doing installations, repairs, or troubleshooting. The specific routines within those jobs vary greatly as well and can include working with electricity, attaching and manipulating PVC, cutting sheet metal and duct work, etc. Each of the various HVAC projects require certain, special tools that must be brought with on every job. One of the biggest complaints about low-quality bags is that they just aren’t durable. Simply put these bags are going to take a beating on the job site and rips and other flaws are going to lead to lost tools. 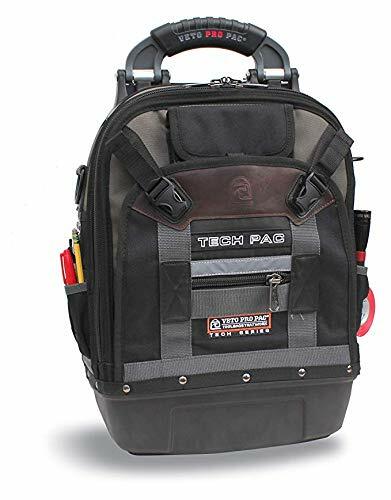 When it comes to versatility of the best bags and backpacks for HVAC technicians the Custom Leathercraft 1539 has got you covered. First of all, there are 54 interior pockets and 4 more on the exterior of the bag. This leaves plenty of options for tool storage of all kinds. There is also versatility within those pockets as they range from zippered side panels to large interior compartments to vertical pouches which are all handy in their own way. 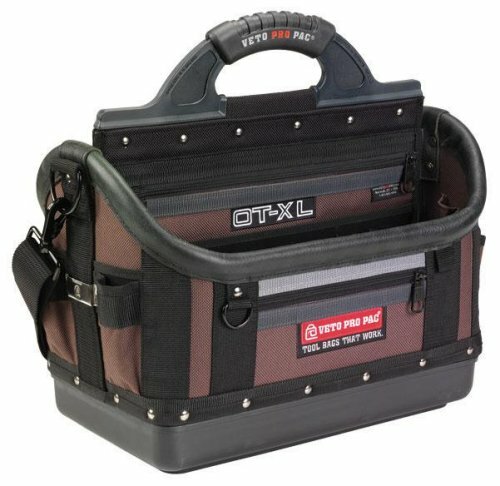 This tool bag isn’t designed specifically for HVAC technicians, which is a good thing – it gives an idea of the flexibility to be able to accommodate satellite installers, plumbers, carpenters, etc. 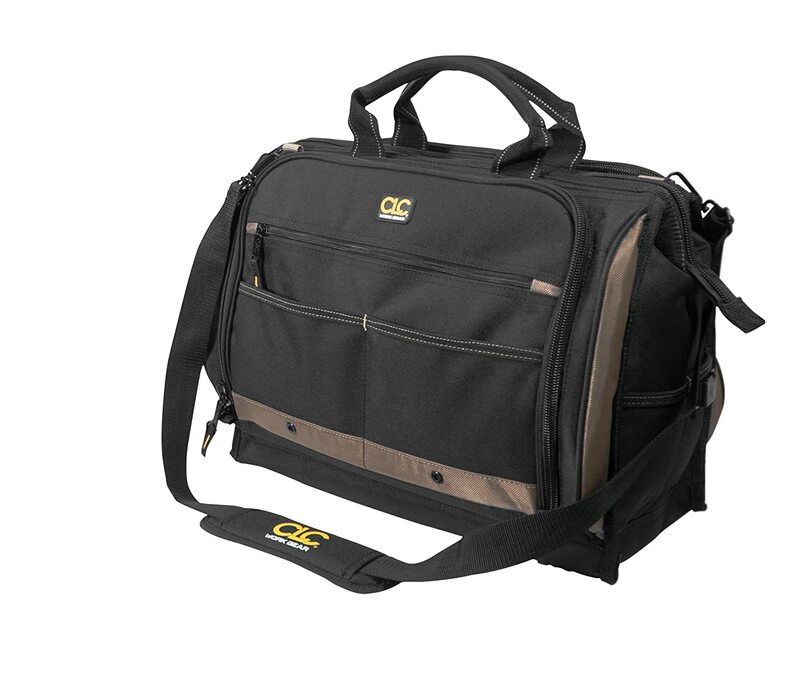 The bag is quality-constructed as well with a poly-fabric body and trim, double-pull zippers, and even a padded adjustable shoulder strap. 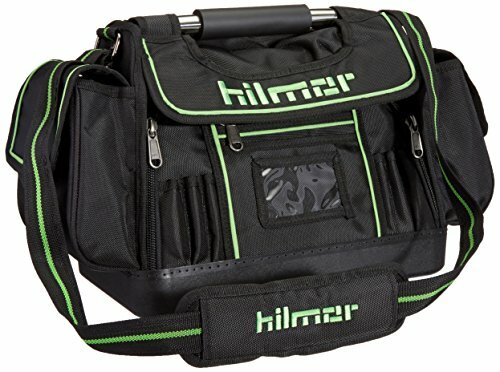 This is a more HVAC-specific bag as it features side components for a multimeter, manometer, and various gauges as well as the necessary hand tools for the job. The design is well thought out, but you’re probably not going to fit all your tools in this bag. It’s a perfect utility for when you know exactly what the job entails however. From the same manufacturers who supply the stand-up bag comes a more traditional, albeit larger horizontal bag. The name of the game with this bag is capacity. It features room for up to 80 or more hand tools spread out over 40 vertical pockets, 2 center storage bays, 4 zippered pockets, and a mounted tape clip. The bag can obviously get heavy with that many tools in tow, but molded ergonomic grip eases the load a bit. A padded shoulder strap also helps with toting the bag around. 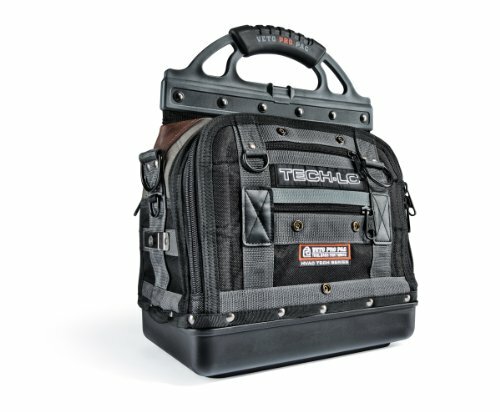 This weatherproof toolbag is also built to last – as evidenced by the included 5-year limited warranty. One thing you’ll notice when shopping for the best bags and backpacks for HVAC technicians is that they can really get up there in price. Many techs are surprised to see $200-$300 price tag – a higher cost for the bag than the tools inside of it. The Hilmore TCB bag is a much more economical choice coming in well under $100. This value bag does lack a bit when it comes to capacity as it features only 24 pockets and 3 side pouches, but that works well as a specialty-job bag or just something to carry along in your personal vehicle for quick fixes. There is still room for the basics and the product does offer a good return on your investment with a plastic, water-resistant bottom and a padded carrying handle. The reason many techs opt for a backpack instead of a bag is convenience. The ability to carry your tools on your back frees up your hands for one less trip between the work area and the truck. Backpacks should be compact and not bulky but with the service personnel’s comfort in mind as well. The Custom Leathercraft 1134 is a great option for flexibility. Some jobs require you to climb ladders or carry awkward parts which is when having a backpack becomes ideal. The product is lightweight to accommodate these needs, but also affordable at under $60 so it can either be your main bag or just used in a pinch. The capacity is definitely there with 41 internal pockets and 7 external compartments to tote a wide variety of tools. Custom Leathercraft has incorporated extra padding so that tools, parts, and heavy weight don’t poke or strain your back. 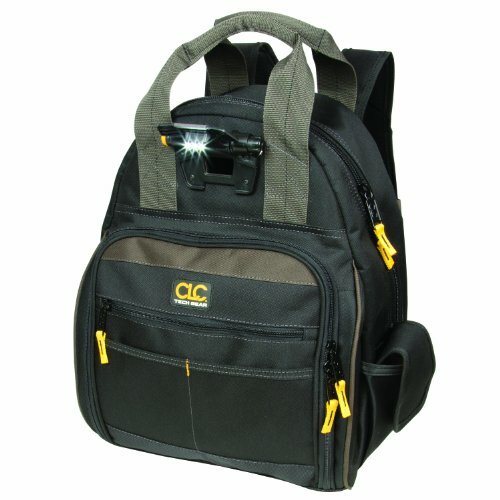 This is in addition to a padded shoulder strap and two soft, yet durable top grips. The bag stands up on its own and won’t flop over on the job like some backpack style products have been known to do. This would be considered the premium model of the 1134 backpack offered by Custom Leathercraft. The L255 features an upgrade in capacity with a whopping 28 tool pockets, 14 accessory pockets, and 11 multi-use compartments. This provides great flexibility in toting tools, parts, and almost everything else needed for a successful job completion. Plus there are 2” straps on the outside of the product to carry cordless drills and their batteries. The L255 also features a built-in LED light that is bright enough to illuminate the job area or can just be used to find the tools within the bag. There is an extra pad on the bottom that creates not only a sturdy base for the pack to sit on, but also helps reduce wear and tear and the risks of damage to the surface of the product. When you have to carry an arsenal of tools up a ladder or across a long distance there is perhaps no other product like the Veto Pro Pac. 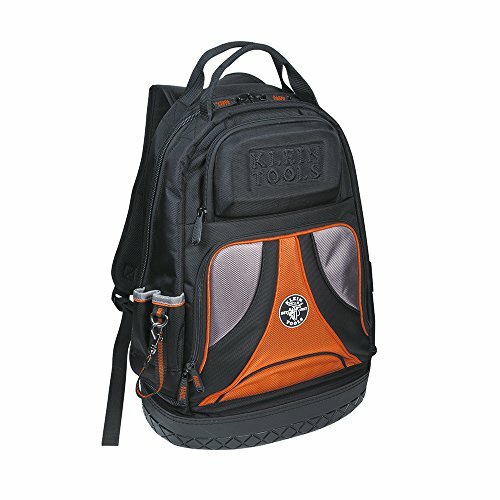 This particular backpack is built for the long haul with a very heavy duty construction which includes a large injection molded base. The plastic base creates a strong surface for the pack to sit upon independently, but is also waterproof and durable to protect tools as well as increase the life span of the backpack itself. There are 56 pockets scattered inside and out on the Velo Pro Pac which provides ample room for nearly all the HVAC tools of your trade. The Veto Pro Pac is innovative as well with a quick release handle that creates easy access to the larger tools. There is also dual bays in the center of the backpack which accommodate two large tools in each section. The Klein Tools Tradesman Pro is an economical backpack (under $90) which doesn’t skimp on quality and efficiency. 39 pockets offer tons of storage, and one of the compartments is a molded front pouch for safety glasses and other special storage. The bag is a bit taller than other industry models which is perfect for longer screwdrivers or hauling lengthier parts. The bottom of the Tradesman Pro is molded as well to protect the bag and its contents from the moisture typically associated with many HVAC repair jobs in basement utility rooms. This backpack also features a little style boost as it is available in either black or camo. Honestly, a quality bag and backpack can legitimately make you money. It cuts down on trips back and forth to the truck and ensures that all your tools are on your person at all times. Having a bag or pack in close proximity makes work safer and it helps with job efficiency – knowing you always have the proper tool instead of succumbing to the temptation to ‘make do.’ Backpacks also allow you to climb ladders in a much safer manner. You’re going to need your tools anyway, so you might as well have an efficient way to carry them. Tool pouches and belts are convenient, but they put a strain on your body and make maneuvering through tight spaces much more difficult. 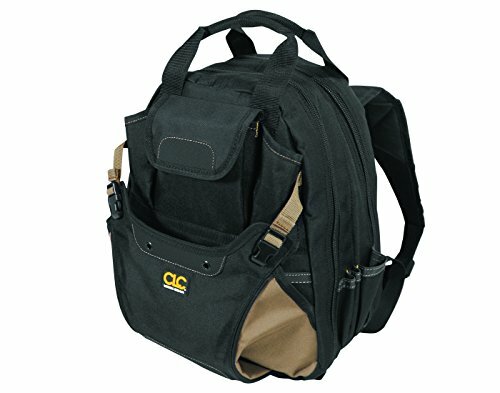 The best bags and backpacks for HVAC technicians carry all of your tools but don’t restrict your movement. To find the perfect backpack for your specific work you need to evaluate the amount of tools you typically need on a jobsite (size of the bag), the kind of repairs or installations you do (bag or backpack), and last but not least your budget. Once these are accounted for, the ideal solution is out there.